Using CRISPR technology graduate students and faculty members at the University of Georgia were able to create the first gene edited lizard. In the past CRISPR-case9 has been used to sequence and edit the genomes of a various species. However, until now no gene edited lizards have come about. In the picture below the gene edited lizard is the albino lizard on the right. Researchers found that the key step in editing the genes of the lizard was first understanding the reproduction system and cycle of reptiles. The genes had to be targeted while still being developed inside of the mother. The gene coding for Albinism was chosen because of its obvious phenotype. Out of a batch of 146 gene edited eggs 3 came out Albino. These researchers will continue to look into why this happens. Hopefully, they come up with more substantial results because this could've been a genomic mutation. 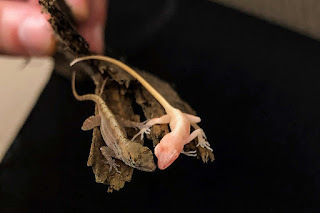 In the future if they're able to produce a larger number of Albino gene edited lizards or try another gene to edit then the result would be even more creditable I think further testing should happen like researchers already plan to do.